Before we went ahead with the set up of the students' own blogs, we had a good discussion about what blogs were and how they were used, as well as addressing some issues of internet safety. The ideas in green are those they came up with at first. Those in purple are what they added after watching the following short video from CommonCraft, 'Blogs in Plain English'. To introduce the class to the set-up process I demonstrated this using a data projector. Firstly I showed them the main class blog and where they could find posts, comments, links, and importantly, the link to their own blog (as yet unactivated). 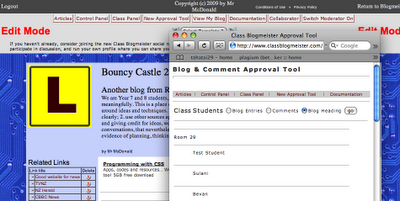 I set up a dummy student blog that I could use as an example, called C3B4Me, and used this to show them what to do. In order to make the steps really clear, I gave them a hard copy of a document that I adapted from the Commlab wiki, which takes students through the process step by step with screen shots along the way. Students also had to choose a name for their blog. I showed them my blogroll on this blog, to give them an idea of the kinds of names they could choose (eg play on words, focus on particular interest etc.). We also discussed the kind of things they could and could not write in the 'About Me' section. All of them seemed to have got the message in our Internet Safety discussion, as they talked about not giving any identifying information, but including some interests. Some even put fake locations (eg Brunei) here, although when we put on a ClustrMap that may blow their cover! One concern I had here was being unsure whether the 'About Me' section also came to me for approval, along with blog posts and comments. Blogmeister have set up a Ning for educators who are blogging with Blogmeister, and this has a forum (along with some other very useful things like video tutorials). I posted this question on the forum and received a reply within ten minutes, which informed me that this information does indeed come to the teacher for approval and is very easy to approve using the New Approval Tool on the main blog. This is a key advantage of Classblogmeister for learner bloggers - EVERYTHING comes past the teacher first, yet it is possible to relax this later on when students demonstrate their competence. Perhaps student bloggers could work towards a solo 'blogging license'!